How much does it cost to travel to Chania? 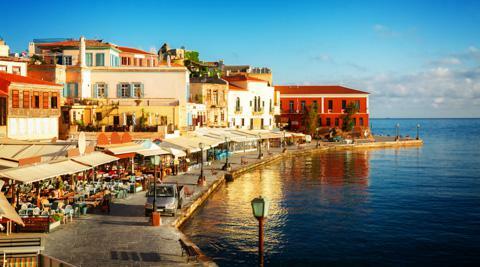 How much money will you need in Chania? €56 ($62) is the average daily price for traveling in Chania. The average price of food for one day is €17 ($19). The average price of a hotel for a couple is €61 ($68). Additional pricing is in the table below. These average travel prices have been collected from other travelers to help you plan your own travel budget. Chania is a city on the northwest coast of the Greek island of Crete. Chania is Crete&apos;s most evocative city, with its pretty Venetian quarter, crisscrossed by narrow lanes, culminating at a magnificent harbor. At the harbor entrance is a 16th-century lighthouse with Venetian, Egyptian, and Ottoman influences. On the other side, the Nautical Museum has model ships, naval objects and photographs. The former monastery of St. Francis houses the Archaeological Museum of Chania. Remnants of Venetian and Turkish architecture abound, with old townhouses now transformed into atmospheric restaurants and boutique hotels. Although all this beauty means the old town is packed with tourists in summer, it&apos;s still a great place to unwind. The Venetian Harbor is super for a stroll and a coffee or cocktail. Plus it’s got a university and a modern area to the city, which means that it retains its charm in winter. Indie boutiques and an entire lane dedicated to leather products provide good shopping and, with a multitude of creative restaurants, you’ll likely have some of your best meals on Crete here. The Chania Archaeological Museum. The setting alone in the beautifully restored 16th-century Venetian Church of San Francisco is reason to visit this fine collection of artefacts from Neolithic to Roman times. Late-Minoan sarcophagi catch the eye as much as a large glass case with an entire herd of clay bulls (used to worship Poseidon). Other standouts include Roman floor mosaics in back, Hellenistic gold jeweler, clay tablets with Linear A and Linear B script, and a marble sculpture of Roman emperor Hadrian. The Firkas Fortress at the western tip of the harbor heads the best-preserved section of the massive fortifications that were built by the Venetians to protect the city from marauding pirates and invading Turks. The Turks invaded anyway, in 1645, and turned the fortress into a barracks and a prison. Today, parts of it house the Maritime Museum of Crete. There’s a great view of the harbor from the top. The Maritime Museum of Crete. Part of the hulking Venetian-built Firkas Fortress at the western port entrance, this museum celebrates Crete&apos;s nautical tradition with model ships, naval instruments, paintings, photographs, maps and memorabilia. One room is dedicated to historical sea battles while upstairs there&apos;s thorough documentation on the WWII-era Battle of Crete. The Church of Agios Nikolaos. One of Chania&apos;s most intriguing buildings is this Venetian-era church with both a bell tower and a double-balconied minaret  the latter replaced a second bell tower during its stint as a mosque under Turkish rule. Inside, the massive bronze chandeliers dangling from a barrel-vaulted coffered ceiling will likely draw your attention. The old town is centered around the harbor, it is a maze of alleys and houses that has been standing for many hundred years rebuilt, ruined, and built up again with details from the different epochs. Old town is full of souvenir, art, and crafts shops. The beaches begin in the city a bit away but not far from the old town. The nearest beach is Nea Hora, a 1 km. walk from the west end of the Old Town. An old ghost-like neighborhood with abandoned buildings representing the industrial past of the city. Some old tanneries were remade into flats, but retain the character and appearance of the old buildings. Splantzia carries the authentic Chanian atmosphere with tranquil corners, old fashioned cafes, and a distinctive suburban flair. This area has many shops and cafes as well as historic monuments such as churches, the most popular of which is the Agios Nikolaos. Located just outside the eastern walls of the old town of Chania, along the seaside road of Miaouli Coast. In Koum Kapi, there are cafes, restaurants and bars, all by the sea and overlooking the endless blue of the Cretan Sea. So, think about Koum Kapi as an additional place for a stroll just outside the old town, and a couple of hundred meters away of the old harbor. The Venetian Port: this is probably one of the most picturesque ports of the country. It is lined with several coffee shops and restaurants and is frequented not only by tourists but also by locals who, on cool summer evenings, stroll up and down. Reaching the port from Chalidon street there are a number of monuments to look out for. Here, you can also see the lighthouse, the naval museum, and the fortress. Visit the village of Maleme. See the German Cemetery on Kaukales hill. It is a haunting experience as on the graves there are names of 16 year old German soldiers. This was the site of the first airborne attack in the history of mankind. The Battle of Crete is thought of as one of the most glorious moments in Greek history as it took the Nazis the same amount of time to sweep through Holland, Belgium and central and northern France as it took them to conquer Crete. You can also see the historical airport battlefield and for nature lovers, you can explore the beach of Gerani where the sea turtle Caretta Caretta is preserved. Visit Samaria Gorge, a popular day trip from Chania. Be sure to bring good shoes. The nature and landscape are amazing. The gorge is home to a protected (under extinction) goat. The sea at the far end of the gorge in Agia Roumeli is absolutely amazing, crystal clear and turquoise. Go for a walk in the Botanical park and Gardens of Crete for some spiritual tranquility and visual pleasure in addition to knowledge on plants and their material. Nearly 20 hectares of land are waiting to welcome you, full of fruit trees from all over the world, herbs, medicinal and ornamental plants in a park different from others, where the land&apos;s formation and the region&apos;s microclimate make it a paradise for hundreds of plants and animals. The cuisine in Chania is some of the best in Crete, and maybe some of the best in Greece. There are more than a hundred of attractive restaurants and cafes in Chania, and every dining place may surprise visitors with its original specialties. One of the most popular and attractive diners is the Glossitses restaurant serving Greek cuisine; it strikes with a variety of dishes. Some popular dishes include: Wild Fennel Pie, Octopus with Avronies (a Greek version of wild asparagus), Sun-dried Tomato Fritters, Spicy Pork With Couscous, Calamari Stuffed With Feta and Herbs, Baklava, and Meatballs Over Fried Potatoes. Make sure to visit the Agora Market in Chania. The market sells lots of local foods and the taverns there are some of the best in Chania. This is where the locals eat. Chania is served by Chania International Airport on the Akrotiri Peninsula a bit north-east of the city. There are several flights a day from Athens to Chania. From April to early November, there are many direct charter flights to Chania from the UK, Germany, Scandinavia, and other European countries. It has recently become a Ryanair hub connecting Chania to over 20 European and Domestic destinations. There are half-hourly buses which can take you from the airport to the center of town. Otherwise you can take a local taxi or book an airport transfer in advance. Ferry services are also available from Athens to Chania. Chania is connected with the rest of Crete by regular bus lines. The coaches are modern, comfortable and air-conditioned. You can also reach Chania easily by car, if you&apos;re driving. In order to visit the best beaches of Crete and to see the interesting archaeological sites of Crete, it is best to rent a car to get around.